The C.A 6117 is an ALL-IN-ONE instrument for testing electrical installations in compliance with the national and international standards (IEC 60364-6, NF C 15-100, VDE 100, XP C 16-600, etc). It combines design, ergonomics, simplicity, performance, rapidity and accuracy. The rugged, compact C.A 6117 is specially designed for quick and effective familiarization. On its large LCD graphical colour display with backlighting, users can view all the crucial results at a glance. A rotary switch on the instrument’s front panel gives direct access to all the functions. A large number of visual symbols and audio signals help with quick interpretation of the results in accordance with the standards. The on-line contextual help menus can guide the user step by step, if needed. The storage capacity can save up to 1,000 tests. The C.A 6117 also has a USB output for data transfer. The high-performance C.A 6117 offers excellent measurement stability, even in disturbed industrial environments. All the measurements needed to test an electrical installation are available: continuity, resistance, insulation, earth and selective earth, loop impedances, type A and AC RCDs. The C.A 6117 can also be used to measure voltage, frequency, current via a clamp, active power, harmonics and phase rotation. 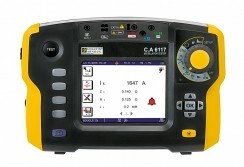 The C.A 6117 is also fitted with type-B RCD testing, built-in fuse table and voltage drop feature. Designed and manufactured in France, the C.A 6117 was developed in compliance with eco-design procedures. The measurements made with the C.A 6117 can be processed by the DataView® multi-product expert processing software. DataView® automatically recognizes the instrument when it is connected to the PC and opens the corresponding menu. By means of a tree structure, it offers users direct access to the data recorded in the instrument, its configuration, etc. It is equipped with multiple predefined report templates which comply with the standards' requirements. Users can also create their own templates, as required. Delivered as standard, the ICT software offers the following functions for quick, simplified analysis of the recorded measurements: recovery of the data, configuration of the instrument, customization of measurement campaigns with transfer into the instrument and generation of reports.